Facebook has become an integral part of the marketing process. More than 1.71 billion people visit it on a monthly basis, making it the third most visited website globally. Every business has at least contemplated establishing a Facebook presence. For some, the social network might not be the right fit, but for millions of others, it’s a must. But unless you’re tracking what you’re doing, how much money you’re spending and what results you’re getting, it’s difficult to determine whether or not your Facebook ROI is actually working. Return on investment (ROI) plays a big role in your decision to not only bring Facebook into your marketing strategy, but to keep it there. The problem with Facebook ROI is it’s different from traditional online marketing. It can be hard to see the value of your post getting shared compared to clicks on an ad. But just because it’s not obvious, that doesn’t mean your efforts on the platform aren’t paying off. Facebook ROI is what your company gets back from the time, money and other resources you’ve put toward social media marketing on the platform. ROI isn’t the same for everyone. How it’s defined for you will differ between other companies based on your specific business goals. Before you can begin tracking Facebook ROI, you need to establish social media goals. These should be quantifiable, meaning it’s something you can attach a number to. For deeper insight on social media ROI and goal setting, check out our Ultimate Guide to Measuring Social Media ROI. 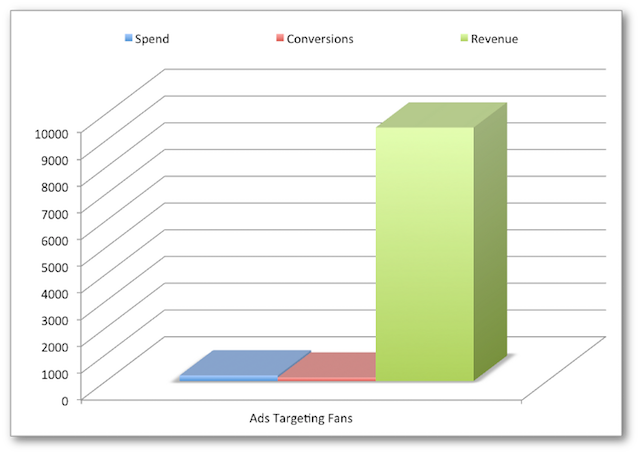 On Facebook, ROI is more than just reach or impressions. It can be measured in a number of ways. For instance, if you’re running Facebook Ads, you could see direct returns generated from ad clicks. If you’re not using ads, you could still see returns in the form of leads, customer testimonials and referral traffic. Facebook Ads are becoming a major part of marketers’ strategies. Of the 50 million businesses with active Facebook Pages, 3 million are active advertisers—a 50% increase from last year. But are they seeing any return? Let’s look at a case study from Jon Loomer. Over the course of 30 days, Loomer spent $297.96 on Facebook Ads that returned $10,510.50 in direct revenue. He divided his attention (and his budget) among three core groups: fans, non-fans and anyone who visited his website. Loomer had the most success with the ads targeting fans. He spent $207 on six campaigns that returned 129 conversions, directly resulting in $9,481.50 in revenue—that’s a 45.9 times ROI. When targeting non-fans, Loomer saw no conversions at all—a stark difference from the previous group. For the third group, Loomer utilized FBX to target users who visited his website. He spent $39.19 and received 14 conversions, resulting in a 26.3 times ROI. It’s worth putting in the time to build a relevant and engaged audience. Find your balance. When targeting non-fans, Loomer created 14 variations of Facebook Ads before giving up. Don’t over do it by constantly bombarding an audience with ads. Know when to push forward with new content and when to bow out. You may think that when it comes to ROI that Facebook Likes are more valuable than shares, but it’s actually quite the opposite. And in a way, shares can be even more valuable to a brand’s ROI than Facebook Ads. A like represents support. It’s a user’s way of saying “I approve of/believe in this” or “I understand”. It’s an act of solidarity, not growth. On the other hand, shares extend your reach to individuals you may not have targeted. It’s almost an endorsement. By clicking share, they’ve established a connection between themselves, the content, the company that published it and their network. Now we know we said that reach and impressions don’t equal ROI, but they certainly play into it. How? It comes down to trust. Two posts about the same product appear in a user’s News Feed. One is an advertisement from the brand and the other is a post from the brand that has been shared by one of the user’s friends. Which one do you think is more likely to resonate with the user? If you chose the latter, you’re correct! According to data from Forrester Research, 70% of U.S. online adults trust brand or product recommendations from friends and family. And while 46% trust online reviews written by other customers, only 10% trust online ads and company written messages. 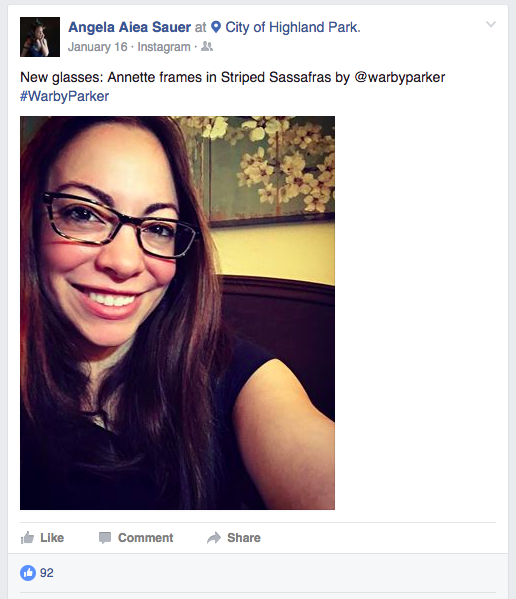 This means that a post from a friend about Warby Parker’s exceptional products could be more convincing (and result in more conversions) than if Warby Parker were to run an ad about its product line. Facebook shares not only lead to organic customer testimonials, but more leads as well. With that said, it doesn’t mean you should suddenly start asking fans to share all of your Facebook posts or tag your brand in their posts. Let shares and mentions happen organically. This way the language associated with the plug will feel natural and authentic, and friends of that individual won’t feel like they’re reading a sales pitch. Social referrals—links shared on social networks—have become a huge source of incoming traffic for websites and online publishers. For a long time, Google was the major driver of referral traffic, but in 2015, Facebook overtook the search giant by a significant amount. According to Parse.ly, Facebook accounted for roughly 43% of traffic to its network of media sites—compared to Google at 38%. Now this may change month to month, but it certainly demonstrates the power of the social network. Your goal is to get people to engage with your content on Facebook, but it’s not uncommon to see marketers send people off site. Especially when promoting a product or event that might need more context. With back-to-school season upon us, let’s look at how JCPenny handled promoting its sale. For starters, the brand used a video to draw in viewers—a smart move considering 100 million hours of video are watched daily on Facebook. It’s a great way to capture the attention of your audience. The video highlights all the new outfits and accessories students can choose from. Rather than post a link to its homepage and assume viewers will find the sale items, JCPenny posted a link that takes viewers directly to the sale page. If you are going to send people off site, it’s best to do it through a landing page where people can get the most relevant information related to your Facebook post or ad. If directed to your homepage, it’s up to the individual to correctly navigate your site and find the details related to what was advertised. By reducing the amount of work on the part of the viewer, you’re increasing your chances of a sale. Even if you’re not promoting a sale, Facebook posts can prove valuable for boosting traffic to your website. The key to driving more views to your on-site content is value. Lowe’s recently killed it with this step-by-step guide to building a backyard fire pit. You can’t expect someone to click through to your website if you’re not offering them valuable content. When it comes to tracking Facebook Likes and shares, it’s easy to monitor these metrics through Facebook’s Page Insights. Here you’ll be able to measure your reach, engagement—including post clicks, Likes, comments and shares—and ad spend (if applicable) for each post you’ve published. While Facebook Page Insights lets you see which posts are receiving the most clicks, the easiest way to track referral traffic from Facebook to your website is through Google Analytics. Even if you’re a complete novice when it comes to Google Analytics, it’s a piece of cake as tracking traffic from social networks is done automatically through its Social Reports tool. The key to tracking Facebook ROI is to consistently monitor and analyze your success metrics. With Sprout Social, we let you do that all in one place instead of having to log in and out of multiple platforms. Using Sprout’s Facebook analytics, you can easily identify your best content and better understand how it’s being shared across the social network. Not only that, but you can also get post-level insights, including the number of Likes, comments and shares your posts are receiving, as well as its reach and how many users you’ve engaged. Most of the time, ROI is apparent to members of the marketing team because they see everything as it’s happening. Co-workers outside of the department, especially members of the executive team, might need a little more convincing. When it comes to sharing this data with the rest of your team, Sprout’s reports make Facebook analytics digestible and ready to present. Without measuring your Facebook ROI, you won’t know where you can improve your efforts, whether the platform is bringing in revenue for your business or how specific changes impact your goals. No part of your social media strategy should be implemented blindly. Facebook ROI isn’t always tangible, but tracking it is possible. Yes, the goals you establish and the metrics you use to define and track Facebook ROI should be measurable, but that doesn’t mean the focus of your marketing strategy should strictly be growing your numbers. When you start focusing more on increasing numbers than building a community, you do more harm than good to your bottom line. Remember, designing content with the sole purpose of getting Likes, shares and clicks won’t mean much if the people who are Liking, sharing and clicking have no intention of becoming your customer. Build a community of engaged customers and design content with them in mind. 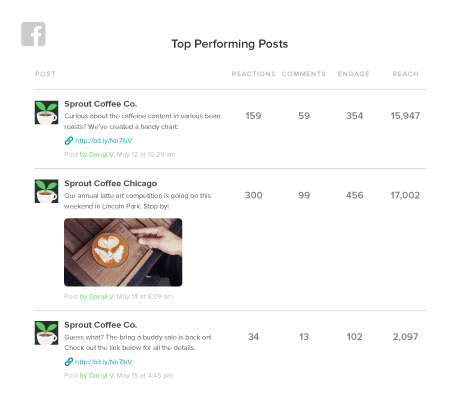 Use a social media management tool like Sprout Social to monitor engagement and track how your content is performing. Base your decisions on those analytics, and use them to make well-informed decisions about your strategy and improving your Facebook ROI.